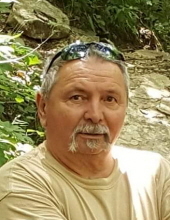 William “Zeke” Sams, age 63, of Arlington passed away at Baptist Health Hospital of Paducah, on Monday, February 11, 2019. He worked at General Tire, Ford’s Concrete, and most recently as a meter reader for New Commonwealth Gas Company. He enjoyed shoeing horses, riding horses and four wheelers down in the river bottoms, and hunting and fishing. Zeke played many string instruments and enjoyed bartering with merchants at flea markets and yard sales. He was a big jokester and enjoyed making everyone laugh. He especially liked spending time with the “bright spot of his life”, Shelby, his granddaughter. Zeke was of the Baptist faith. He is survived by his wife of 44 years, Sheila Jeter Sams of Arlington; his mother, Wanda Sue McBride Sams of Arlington; his daughter, Michelle Sams Howard (fiancé Jeremy Hickman) of Arlington; his son, Jarad Sams of Paducah; his granddaughter, Shelby Lynn Howard of Arlington; and his sister, Rose Mary “Rosie” Sams of Dexter, Kentucky. He was preceded in death by his father, James William “Hoover” Sams. Funeral services will be held at Milner & Orr Funeral Home of Arlington on Thursday, February 14, 2019 at 11:00 a.m. with Rev. David Gossum officiating. Burial will follow in Roselawn Cemetery. Visitation will begin at 5:00 p.m. on Wednesday, February 13, 2019 at the funeral home. Expressions of sympathy may be made to the Gideons International Carlisle-West Graves Camp, P.O. Box 608, Cunningham, KY 42035 or to Cassidy’s Cause, 6075 Clinton Road, Paducah, KY 42001. To send flowers or a remembrance gift to the family of William "Zeke" Sams, please visit our Tribute Store. "Email Address" would like to share the life celebration of William "Zeke" Sams. Click on the "link" to go to share a favorite memory or leave a condolence message for the family.